An optional software license will enable you to remote control all ALEXA Plus type cameras, except the ALEXA HD Plus. This includes setting frame rate, shutter angle, exposure index, false colour on the monitor output, and more. Extended camera status information is also available, allowing you to quickly check your camera settings at any time. Various parameters of the WCU-4 can be set up to one’s personal preference. These include the display arrangement, vibration patterns and programmable user button, to name just a few. You can save your preferred settings on an SD card, enabling you to immediately personalise any WCU-4, anywhere in the world. 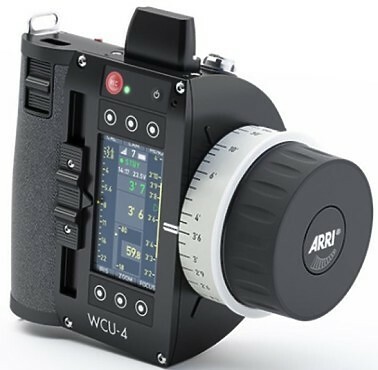 Hire the ARRI Wireless Control Unit WCU-4 from Procam. Best service and rental rates for the ARRI Wireless Control Unit WCU-4 and all cameras, lenses, sound, lighting and grip.